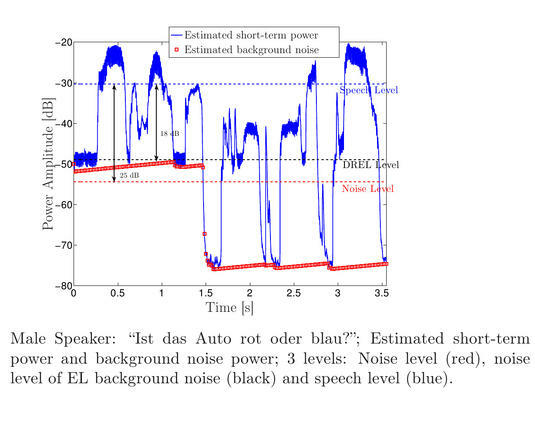 In this paper, we describe the German parallel Electro-Larynx speech -- Healthy speech (ELHE) Corpus which has been recorded in our recording studio. 3 female and 4 male healthy subjects recorded up to 500 sentences spoken one time with healthy speech (HE) and one time using the Electro-Larynx (EL) device. Analyses of signal-to-noise ratios (SNR) have shown the following: For HE speech only two levels (noise and speech) can be distinguished but there are three different levels inherent in EL speech (see figure): noise, direct-radiated noise from the EL device (DREL) and speech (corrupted with DREL). First-order IIR smoothing was used to estimate the short-term power of the signal and of the noise whereas the DREL level was found using an iteratively changing threshold. Statistical analyses have shown that the length of EL sentences is longer than for HE sentences. Moreover, the fundamental frequency f0 of EL speech depends on the EL device and the variance of f0 is larger for HE speech due to the missing changing patterns of EL speech. This corpus can be used to analyze differences and similarities between healthy speech and disordered speech and based on this knowledge to improve the disordered speech.